We use the following narrative to inform context for all future communications and as the foundation of the story we want to tell and the experience we want to create. “To meet the challenges we face on this planet, the status quo is no longer enough. The future of life as we know it is uncertain. There is no sole solution, no one technology, no single game-changer; what’s required instead is collaboration, research that crosses boundaries (natural, artificial and social) and solutions that mirror the complex eco-system of sustainable living. From how we feed the world and preserve its nature to how we live, interact and thrive in our communities and businesses here at home, we must continue to evolve. We must improve. The University of Guelph, and everyone who studies here, explores here, teaches here and works here is committed to that simple purpose: To Improve Life. We improve life by focusing on the whole person to shape better citizens of the world. We improve life by passionately engaging in our communities. We improve life through rigorous exploration in the natural sciences. We improve life by finding better ways to nourish all living creatures. We improve life by partnering in and teaching ethical, sustainable business practices. We improve life by teaching the arts and integrating culture into all fields of study. We improve life by engineering solutions that safely connect humankind to this planet and perhaps beyond. We improve life by nurturing positive and respectful social interaction on this campus. We improve life by openly celebrating our capacity to be inclusive. We improve life by attracting and supporting students, faculty, and staff who share the belief, the passion and the will to do so. To improve life is our shared challenge. What role will you play? How will you participate locally, nationally and globally? What will you achieve before you leave? What will you achieve after you leave? How will you help us tell the world? The Strategic Framework provides detailed and descriptive aspects of our Improve Life brand. 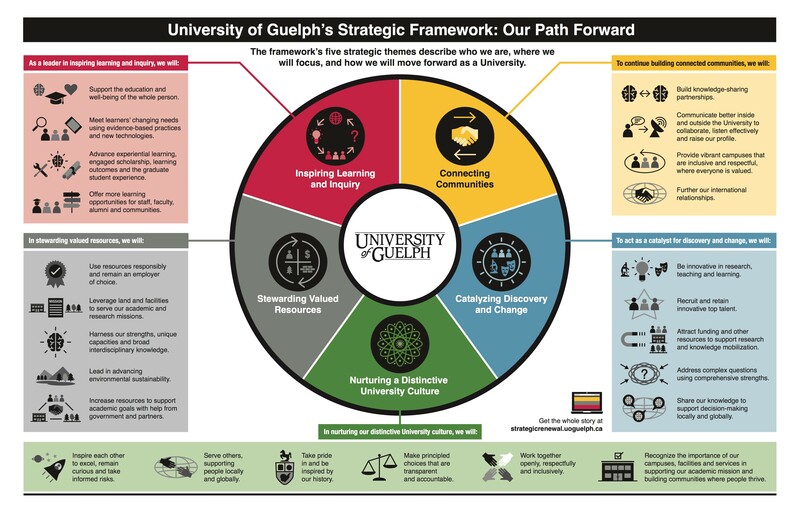 When creating content and direction for U of G communications, use the Strategic Framework to inform and evaluate your approach.